Do you smell that intoxicating smell? You know the one: a freshly marinated steak, charred veggies, or even the aroma from a plump bratwurst. You don’t smell anything? Well, that’s because you aren’t the proud owner of a Monument Grills 4-Burner Gas Grill with Sid Sear Burners yet. This grill is the perfect solution to those summer grilling blues. Thanks to 4 main burners, 1 side burner, 1 ceramic sear burner, and 513.3 square inches of cooking area, this grill can handle all the tasy food you can throw at it. With it’s propane gas compatibility, you no longer have to worry about fiddling with pesky and hard-to-light charcoal. From the pilotless ignition to the built-in thermometer, this Monument Grill keeps the users in mind and is sure to provide an enriching grilling experience for many backyard barbecues to come!MG-98475 Barbecue’ing on the grill is great. It’s truly tough to top the smell of sizzling meats and veggies on a warm summer day. But what do you do with your grill when the fun is done? Do you let it take a beating from mother nature? Of course not — you protect it with the Monument Grills 54-Inch Weather Resistant Grill Cover. 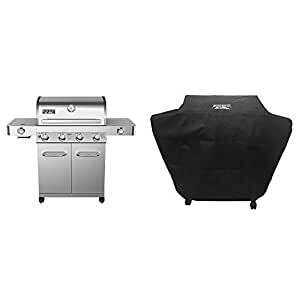 This cover fits all Monument Grills 4-Burner Grills and is made with durable polyester fabric. This fabric helps protect your grill from the harshities of dust, pollent, pests, dirt,and weather. Plus, when it’s time to break out those tongs and fire up that grill again, simply take the cover and roll it up for safe storage. Keep your grill protected and working at peak condition with the help of this cover from Monument Grills.